Almost 1 billion smartphones (998 million to be exact) shipped in 2013. Compared to 2012, this represents a 44 percent year-over-year increase. The latest figures come from Canalys, an independent analyst firm which found Android’s dominance grew with the platform running on 79 percent (785 million) of the devices shipped in 2013, up from 68 percent in 2012. At the same time, Apple’s iOS share fell from 20 percent to 15 percent, despite shipments increasing to 154 million. Microsoft saw its platform gain a percentage point to 3 percent as shipments increased 90 percent in 2013 to 32.1 million. Those were driven mainly by Nokia’s Lumia devices, which managed to stay ahead of BlackBerry, at 19.8 million units. In operating system terms, Windows Phone saw the fastest year-on-year growth among the major platforms: 69 percent, despite a modest sequential decline of 6 percent from Q3 2013. This compares favorably with Android shipments, which grew 54 percent, and iOS shipments, which grew just 7 percent. It’s worth noting that these figures are very similar to what Strategy Analytics reported just yesterday: Android up to 78.9 percent in 2013, iOS down to 15.5 percent, and Windows Phone up to 3.6 percent. It seems there’s a consensus that Android was on four out of every five smartphones shipped last year, iOS lost share to about three out of every 20 smartphones, and Windows Phone settled down to take third place. 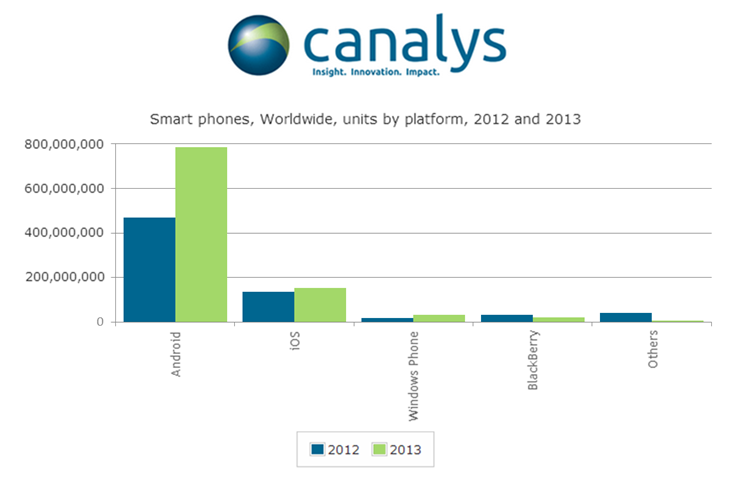 Canalys also noted Samsung performed strongly in 2013, strengthening its position as the world’s leading smartphone vendor. Its market share grew from 30 percent in 2012 to 32 percent in 2013. Apple took second, but Huawei edged past Lenovo to claim third, although the difference there was only 5 million units. Lenovo’s purchase of Motorola from Google, assuming the deal goes through, will put the Chinese company back in third. “Lenovo must continue with Motorola’s speed-of-update strategy and ensure it can create pull for its smart phones through the carrier channel in mature markets when up against the might of Apple and Samsung,” Canalys VP and Principal Analyst Chris Jones said in a statement. “We expect Lenovo to double its worldwide smart phone market share within two years and achieve double-digit market share by 2015 at the latest. How Lenovo’s deal affects all the other Android players, including Asus, LG, and Samsung remains to be seen. Microsoft will also be looking to push Windows Phone. We’re in for an increasingly heated battle in 2014.